A geothermal heat pump system is a central heating and/or air conditioning system that actively pumps heat to or from the shallow ground. It uses the earth as either a source of heat in the winter, or as a coolant in the summer. This design takes advantage of moderate temperatures in the shallow ground to boost efficiency and reduce operational costs. It may be combined with solar heating to form a geosolar system with even greater efficiency. 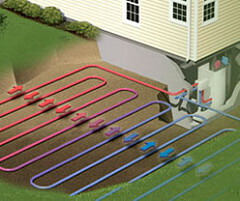 What's nifty is that the system can both heat and cool a house more efficiently than conventional systems, since, during the winter, the ground is warmer than the air outside (hence heating the air in the underground pipes); while, during the summer, the ground is cooler than the outside air. Overall, a geothermal heat pump is 23 to 44 percent more efficient than standard heating and cooling, although the actual savings in greenhouse-gas emissions depends on a lot of factors: A heat-pump system powered by coal-fired electricity actually produces slightly more emissions than a natural-gas heating system, but far less than electrical heating or A/C. And a heat-pump system powered by, say, renewable energy leads to fairly hefty reductions. Of course, like many energy-saving devices, these geothermal systems cost more upfront to install—it's not exactly a do-it-yourself project—but they pay for themselves within five to ten years. And, since efficiency has been all the rage of late, the industry was booming before the big recession—growing 33 percent in 2006 and 36 percent in 2007, according to the EIA.